About Deception pass bridge is located on the north end of Whidbey Island in Washington State. 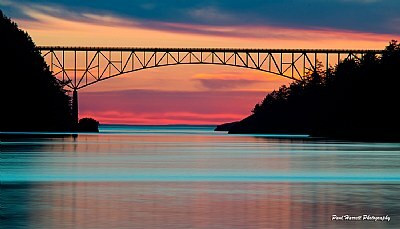 The story goes "Deception pass" was named by George Vancouver in 1792 because it had misled him into thinking Whidbey Island was a peninsula. Fantastic composition with stunning colors and hues. play. Excellent visual and initial impact. Great technique with excellent technical excellence. A true pleasure to view.